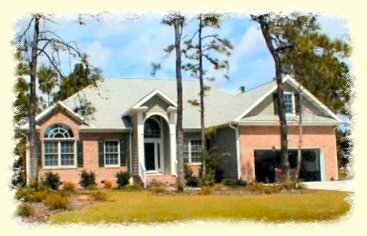 Single Story Home Under 2500 Sq.Ft.-GMB970418-Carolina Coastal Designs, Inc.
An elegant, arched-entry, fronts this transitionally designed 3-bedroom brick home. 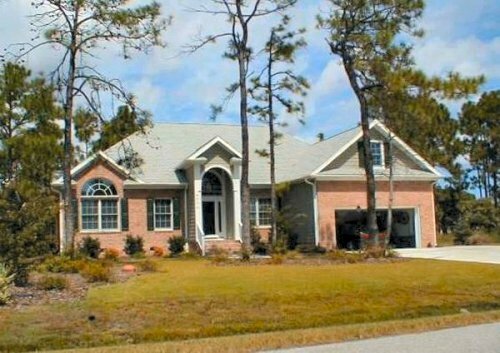 Vaulted ceilings above an open floor plan, along with a profusion of windows and skylights, all add to the bright and spacious feel of this St. James Plantation home. The entry foyer, which leads into the great room, has French doors flanking it that open to both a cozy den on one side and a formal dining room on the other. The great room has a vaulted ceiling, a wall of windows opening to an outdoor deck, and a cozy wood-burning fireplace. A modern kitchen with a separate cooking island and a large snack bar adjoins the great room and a breakfast room. Sliding doors in the breakfast room open to a screened porch for casual outdoor dining. The spacious master bedroom suite has a tray ceiling and opens to a screened porch. Two additional bedrooms and a full bath are also provided in this lovely home.